My lovely wife spoiled me this past Christmas! Besides the other wonderful things she got me, she got me four new games! She also got me a $25 PSN card and renewed both my subscription to PS Plus and at GameStop, so I can keep getting my monthly Game Informer magazine that I so look forward to every month. So she did a great job of setting me up! I immediately stopped playing Beyond : Two Souls, I just wrapped up the Navajo chapter. Which turns out to be Chapter 14 of 24, so I’m a little more than halfway, which I thought I was much closer to the end. I failed a crucial moment in the Homeless chapter (thus far, my favorite chapter) so if it is like Heavy Rain and allows Chapter Selection (I imagine it must), I’m going to go back and make Aiden do his job at the end as I mistook the controller vibration and thought I was shielding Jodie and it looked like I was but clearly I wasn’t. While organizing Walker Dennis’ Christmas presents, I accidently happened upon my box and saw Detroit : Become Human on the top of it and immediately stopped looking. But that encouraged me to get one playthrough of Heavy Rain successfully done and I missed out on two nights of playing Beyond : Two Souls, but even if I could play those levels, I wouldn’t have finished it. I do like how there are longer chapters and short chapters, so nothing feels like it drags, and the longer ones feel more important. I’m getting to know Jodie a lot and get invested in her story as I’m aware of the big moments in her life and the smaller more character defining moments. There was a moment when Jodie really wanted to go outside and I was fully supporting her, until we got almost outside, and then I started regretting the decision. First chance I had to go back, I took it. It wasn’t the most exciting chapter but I felt like I was actually making real chapters. That was Chapter 12, Like Other Girls. There was this fun thread on the subreddit, patientgamers, about backlogs. That seemed like it was in good fun the first day and then the second day, people starting cropping up about making lists makes a fun entertainment pastime into more of a chore. Which I guess one could view the challenge like that, if they wanted too. Essentially, the thread was about trying to minimize one’s backlog of games, by dedicating a month to one game, with the goal of beating or finishing that game within the month. I imagine, if you beat a game early, then you can start the next game in the backlog. Some people were very committed and knew they could finish multiple games in one month but I liked the idea of prioritizing 12 games. With my hour and a half I get to game at night, there’s no way I’m finishing a game a month but I like the thought exercise. Plus, it gives me a chance to actually list out the games I have and see which ones I want to play next. So here’s my list and the order I think I roughly want to work on them. Those are probably be higher priority ones and the ones I’m mostly interested in playing. I from Heavy Rain to Life is Strange : Before the Storm, I wanted to break up franchises as well as not have similar playing games like Heavy Rain and Life is Strange, where they are story based games with decision trees, being played back to back. SOMA, I’ll probably play with YouTube walkthroughs in front of me, or at the ready, as I clearly can’t go more than three or four sections before needing help. 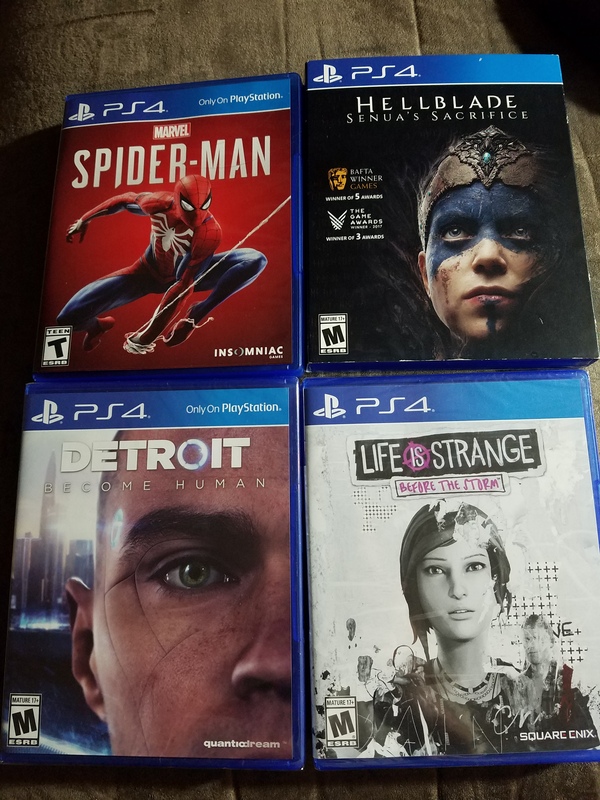 My wife is clearly never playing with the PS4 again as I think she played a little last January but it has been a full year so the games I got for her or the games we played together, are up for grabs. Those would be LittleBigPlanet 3, Crash N Sane Trilogy, Atari Flashback Classics Vol 2, and Inside / Limbo. I’ve been wanting to get some DLC for LittleBigPlanet 3, like the TMNT hero pack and Batman. That should cost me around ten dollars or so. Those would be the ones I seek first, my PlayStation wishlist on the store is filled with other DLC packs from that game. She’s a huge fan of Atari’s Maze Craze, so whenever I see I can get a copy of it, I buy it as we now own it for both the PS3 and the PS4. My son and I have started the 2016 Ghostbusters game, and he seems to be done with it but I hope to get to that game eventually and finish it one of these days. It’ll be nice if I had two more controllers but at $50 each, that’s not going to happen. That’s You was a 98 cent game I got at the GameStop in Bozeman. So that’s on my bottom of the list. I figure I’ll do it like I did with Hidden Agenda and at least get a two player game done. I’ll never get the six player trophies but still, a game that cost less than a dollar, that sounds like a deal to me. Hellblade looks and sounds like an amazing game, so I really want to follow Spider-Man with that game. I really want to get into Uncharted 4 after playing 3 and I want to clean up a few more trophies in 3 which I’ll probably do before playing 4. Knack, I’m well into the fifth chapter so I need to get back to that game as well. Especially if I can finally commit to playing a chapter section before going back to whatever is my main game. Which I rarely want to do as I love jumping back into my current game and not having to suffer those thirty seconds to load the game and get back into the flow. I was enjoying Grand Theft Auto V but I clearly am not stressed about getting back into it so I have that lower on my list of games. Darksiders II, was the my first free PS Plus game so I gave it more attention than I did with future titles (that I didn’t complete), so I want to get that one done too. Subscribing to the Trophies subreddit really influences me too, as I see what games other people have got the platinums for. Then I want to play those games. I’m also subscribed to the Uncharted subreddit so that encourages me to want to play Uncharted 4 and clean up 3. I finally got to Rank 14 on the PlayStation, it has only taken me ten years (with five of those being a gap year) but I’ve finally done it. I was edging 98/99% for the longest time but with the help of Uncle Ben, I got to 14! I doubt I get to any of these games but my goal is at least play the top six games. I did get a few trophies in OnRush so I should try to get through that game some more too. Going down my list of trophies through the PS App, I do have several games with one or zero percent complete so I’m not worried about those but OnRush has five percent, and Sparkle 2 has four percent so clearly I can quantify an interest in one game over another game by one mere percentage. Walker Dennis and I also started Foul Play, but we haven’t gotten back to that game either. I sort of forgot about it. Trackmania Turbo I’m done with even though we didn’t finish it but ten percent might be all I can do. Knack I have eight percentage so maybe that game has more chapters than I think it does. I know there is a slew of collectibles that I don’t have. Both Knacks have 15 chapters so I’m a third of the way complete with that game. I thought maybe it had seven chapters and I was close to the end but that adds up. I’ll probably never get Knack 2 on my own either. Crash Bandicoot sits at 13 percent complete. forma.8 sits at ten percent but I’m also done with that game as no YouTube has attempted that game with the lack of videos. Shoot, Darksiders II is only at one percent and I feel like I’ve played that game for a while. I’m probably only on the third section of that game but it was fun and the third game is out now. I’ll never get it on my own but I’m aware of it. A new developer too, if I recall correctly. With the $25 PSN card my wife gave me, I quickly bought the entire $24.99 The City That Never Sleeps DLC packs for Spider-Man, so that felt pretty good. Later that week, I really wanted to use a Spider-Man theme and avatar but couldn’t find it in the store. I reached out to Insomniac through twitter and they told me to check eBay. Thanks to a great eBay seller, hi_corp, I was able to get the PRE-Order DLC Bonus. For $7.50, and same day delivery through e-mail, I got so much! There is a second Battle dynamic theme that I could also have bought for $2.99 but I took on a chance on the above as it came with an avatar, that I didn’t know I wanted until I saw it listed. 5 extra skill points is nice, and early access in the game to three suits, that also saved me resources as I could spend those resources on other suits and other gadget upgrades. 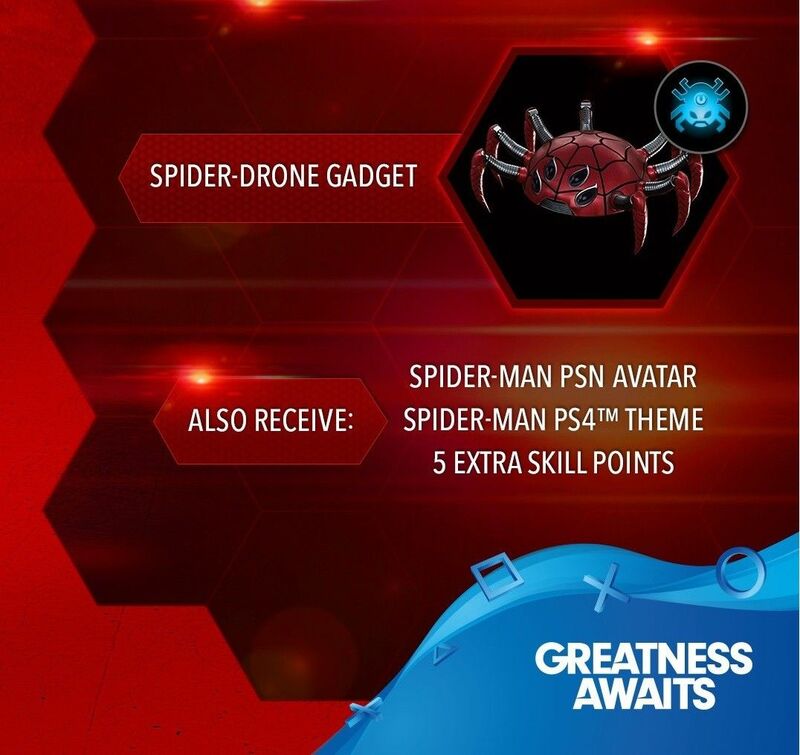 Oh, and it gave me the spider drone gadget early too. Plus those suits abilities as well. I’ll probably never use the Spider-Punk suit or the Velocity suit but I’ll probably use the Avengers : Infinity War suit one of these days. So all of that sounded amazing. I’m not sure who is paying an extra $2.25 from another seller while my guy was selling it for less but I went with the guy who was selling it for less. Turns out there are two different themes but I’ll never use two themes, so I was okay with the first one. I like how mine is pretty basic and it makes a fun thwip sound when I move from item to item on the Home bar. I’ve started really enjoying having the theme match the game I am playing. I was using the Life is Strange one, but hadn’t started the game, and with Spider-Man, I knew I wasn’t getting back to Life is Strange anytime soon, so I didn’t want the constant reminder about it. While playing Uncharted 3, I wanted an Uncharted theme but they were all $2.99. 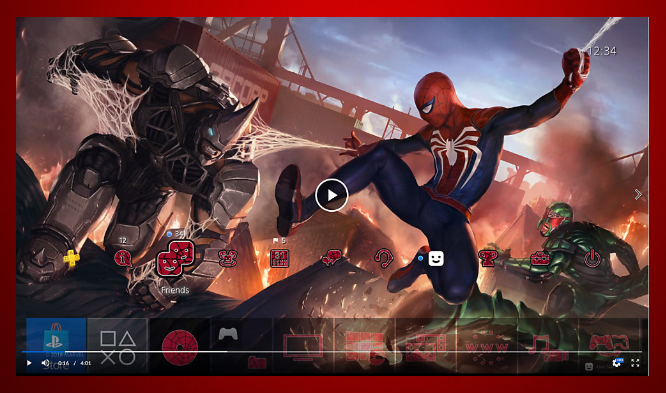 Then while looking at the available themes, I had realized I already own an Uncharted theme, so that was a missed opportunity. I’ve checked and I couldn’t find a LEGO theme, so that was disappointing. I’m not sure what determines which games get themes. 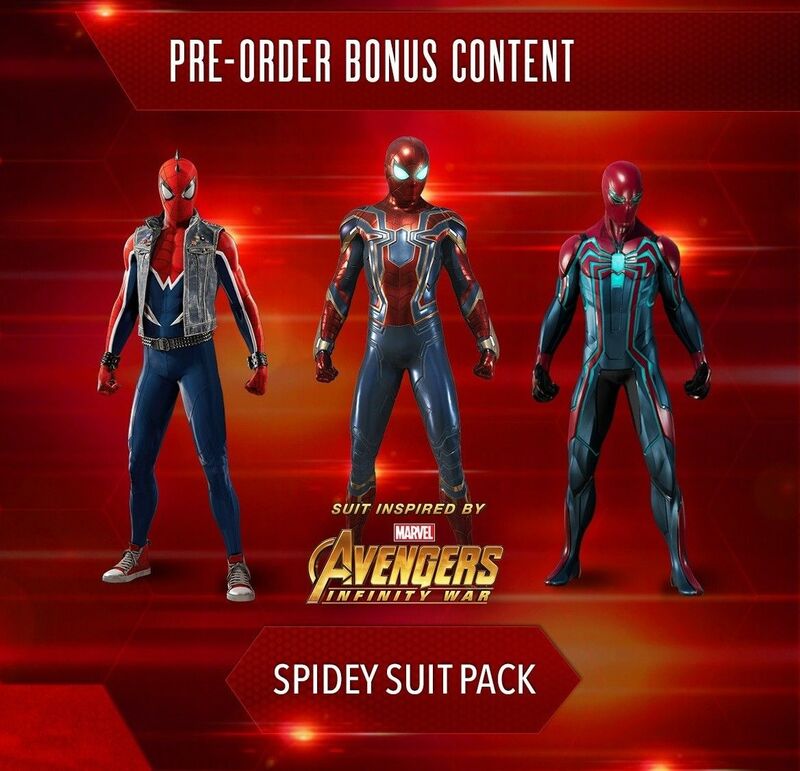 True to my word, as soon as I could unlock the Scarlet Spider suit, I definitely did. I also did a few too many side items or found a few too many collectibles as I was leveling up but I was enjoying swinging around so much. There is a main story mission that instructs us to start taking pictures of landmarks, and once you have taken two landmark photos and stopped three crimes, you can use those tokens to unlock Scarlet Spider at level four. A very handy guide on what it takes to obtain all of the base game suits. I really want the Stark suit too, so I made a point of getting that one and the classic suit. 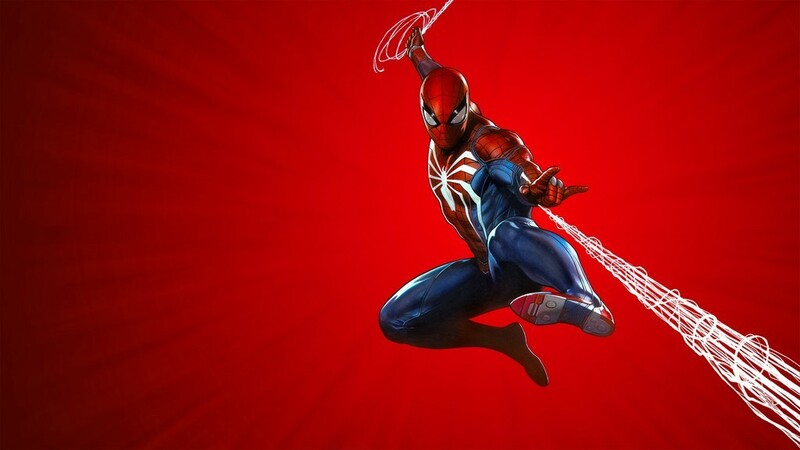 My next suits I really wanted and unlocked were the Spider-Armor MK IV suit (the All New All Different suit), the Spirit Spider (as my son thinks it looks cool). My next goals are the Vintage suit (the one that looks like it is straight from a comic page), and the Last Stand suit. I’m getting a slew of trophies which is fun and the game is known for being an easy platinum but now I’m getting worried I’ll be one of the few that can’t get the plat but I’m hoping to do the work and earn it. The ones that I think are going to be hard hurdles are going to be getting Spectacular (Silver) on the Taskmaster challenges. I can do the Combat ones very easily but the drones and bombs seem to be beyond my abilities. I’m hoping as I rank up, I’ll get increases in swing abilities and such. So expect a more detailed Spider-Man write up and a Beyond Two Souls one. I figure I’ll finish my first Beyond Two Souls one, then go back to Homeless and do a one and a half playthough but making different choices, then recommit to Heavy Rain but I’ll do a Beyond Two Souls post while replaying Heavy Rain. So those are my gaming goals for 2019! Also, whenever Man of Medan gets released, like Spider-Man, that’ll move up in my list of games I play.